Stale Gum: Yes, This Guy Is Real. 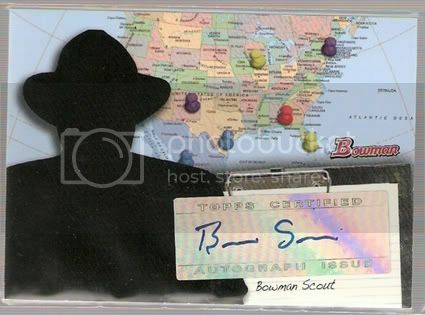 In an attempt to gimmick away what little relevance their Bowman brand still had with collectors, Topps has included autographed inserts of over 20 Major League scouts in their just-released 2008 Bowman. But some collectors have had questions about this particular scout card. This is an autograph of the mysterious "Bowman Scout." Who is this guy? Is he even real? Or do we have another Kazuo Uzuki? Or "Rip Master?" First off, yes, The Bowman Scout is a real person. He is an actual scout for an American League team who has worked as a consultant for Topps since the early 90s. According to a 2006 interview with Beckett, The Scout (who wishes to remain anonymous) says he attends 300-400 baseball games a year, ranging from high school to the Big Leagues. Among The Scout's greatest "discoveries:" Mike Piazza (1992 Bowman), Jorge Posada ('94), Matt Holliday ('99), Jose Reyes and Justin Morneau (2001). And despite his work with Topps, he says he doesn't collect baseball cards. I think the same guy what signed "Santa" on the cards in the Christmas Box Set signed these "B~~~~ S~~~~" stickers. That's right. You know what I'm sayin'. BOWMAN SCOUT IS MOTHAFUKKIN SANTA CLAUS!!! He only works one day a year, he's got to kill the summers doing something. Hey, you're right! I think that *IS* the same handwriting as the Santa cards! Nice GI Joe ref there, too!